What's so special about this wallet? This is one of our cork series products. It is made of the outer layer of oak tree, combining the later with linen, hard paper and or nylon. 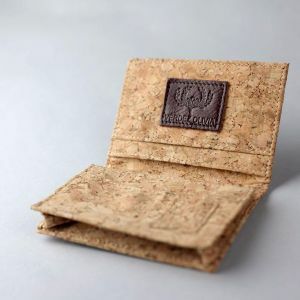 Cork-related material has a lighter weight, smooth in texture and it's also more durable. - Complimentary engraved personalised text on seperate piece of leather attached on top with 8 characters max, only in capital letters or mix with numbers (A-Z, 0-9).